Ok, so firstly, I need to confess that I didn’t know that Snoop Dogg had changed his name to Snoop Lion. But rest assured, I’ll be looking into it. 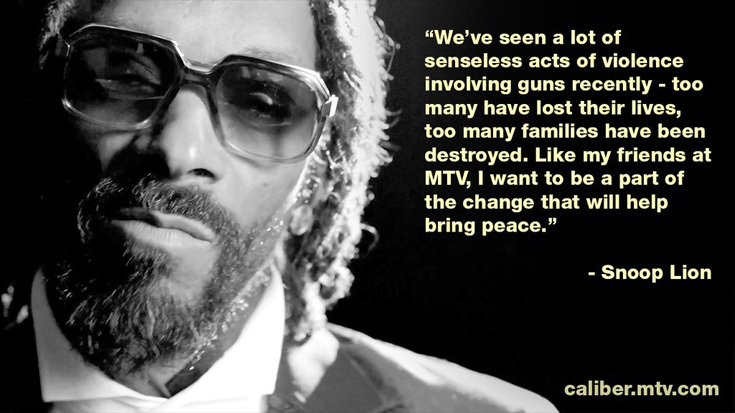 That aside, I recently saw an interesting post on the Ecouterre website about Snoop Dogg/Lion supporting an MTV initiative to recycle US guns into jewellery. And that sounds like a much better use of the metal to me. One of the MTV x Caliber limited edition bracelets. That’s the special MTV bracelet – not really made of recycled guns, but featuring the serial number of a gun that’s no longer on the streets, which is still very cool. But the story is even better for other jewellery in the Caliber Collection – they use actual ‘guns and bullet casings seized by law enforcement’ to make their pieces, some with added diamonds to up the bling factor. So much prettier – brass with eight little diamonds (and the number of the Newark gun it came from). You can check out the full Caliber Collection at the Jewelry for a Cause site here. And back to Ecouterre – if you haven’t checked it out, it’s a pretty interesting site: ‘your online guide to the best ideas, innovations and emerging trends in eco fashion, sustainable style, organic beauty and ethical apparel’. It’s here. Oh, and if you want to read more about Snoop Lion, his Wikipedia page is here. I prefer the Simpson’s take on this – the episode where they had a gun amnesty and turned them into a children’s playground. That nearly ended very badly for everyone concerned! (it’s the Treehouse of Horror XIII in case anyone wants to watch it).